I perhaps don't do the greatest job at keeping everyone up to date on what's up at my own shop. I think I've done pretty well at showing you some other fabulous etsy shops, but today, I think its my turn! Here is a recent project that I completed. This set was intended for a sister-duo who will attendants in their mother's upcoming wedding. The earrings were listed in my shop first. The buyer wanted a matching cuff bracelet and this is what I came up with. I was very pleased with the result. So much so that I expect an in-the-near-future shopping cart will contain many more of these patinaed leaves. I think that the blue/black of the leaves will work equally well with quite a rainbow of colours. 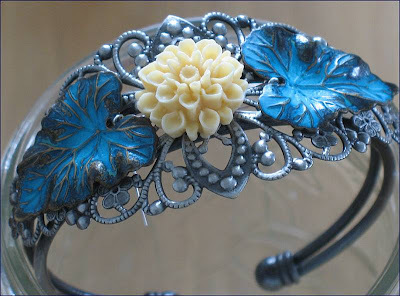 Flowers continue to bloom in my shop, and luckily, I did take a chance and order more of the filigree cuff bracelets . 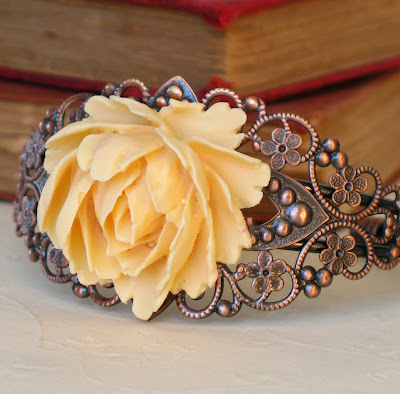 Here, I mixed a copper cuff with a pale buttery rose. Finally, in addition to bobbypins and hairsticks, a small selection of hairbands is now in stock. 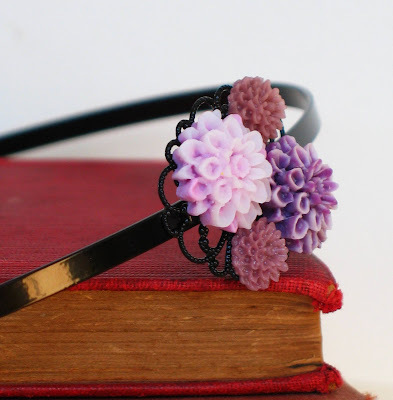 I think that Alice in Wonderland will re-popularise the hairband, and these little floral sweeties will be perfect. 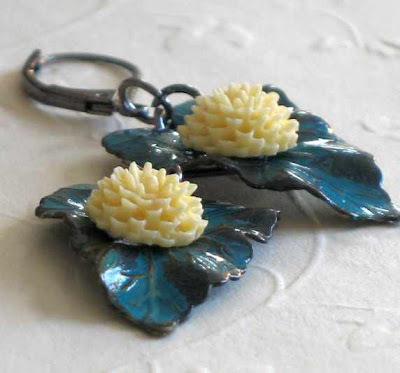 If you want to see what else is blooming in my shop, click on my etsy sidebar. Thanks for stopping by!